Inspired by the aristocratic charm of prewar Fifth Avenue design, this set of two Lattice Urn table lamps brings grand style to any room. 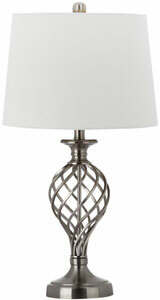 Each posh white cotton shade sits regally atop a nickel-finished base alive with the texture of decorous curves. Dimensions (W*D*H): 14" X 14" X 26.75"
Shade Dimensions: Shade Bottom: 14" x 14"
Bottom Base Dimension: 6.125\" X 6.125\" X 3.5\"
Lamp Body Dimension: 5.25\" X 5.25\" X 10.75\"
Body Dimension W/O Shade & Neck: 6.125\" X 6.125\" X 14.25\"